This has been the recurring nightmare from which there will be no escape until Labor Day. We’ve had an exceptionally wet start to our summer in the southern Ohio River Valley. The rash of daily summer thunderstorms has left me wondering if I really live in central Kentucky or southern Florida. The upside of all the water is the lush green grass pretty much everywhere and some of the healthiest vegetable plants ever to grace the One Bearded Garden. But it’s also led to a lot of sad staring through rain-soaked windows and empty golf courses. When asked what I was doing for the Independence Day holiday by my best friend, I replied that I was barbecuing for the whole family and praying for dry weather. 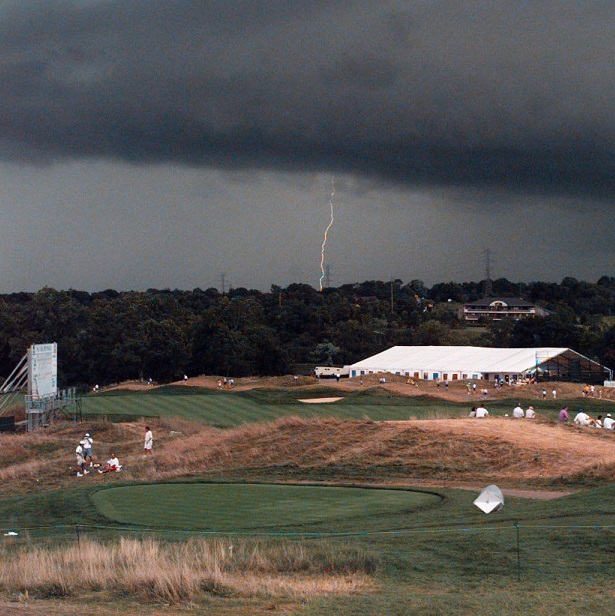 I was promptly accused of having gone soft for delaying or declining a golf outing on account of rain. While not conceding the veracity of such an ugly accusation, it did bring to mind memories of yore when it was perfectly likely that I would get caught in a downpour on a golf course and be perfectly okay with it. Rain pants. Golf bag rain cover. Windbreakers. Waterproof jackets. Waterproof pants. All weather gloves. Waterproof shoes. Big umbrellas. Little umbrellas. And enough golf towels to soak up the The Great Ohio River Flood of 1937. 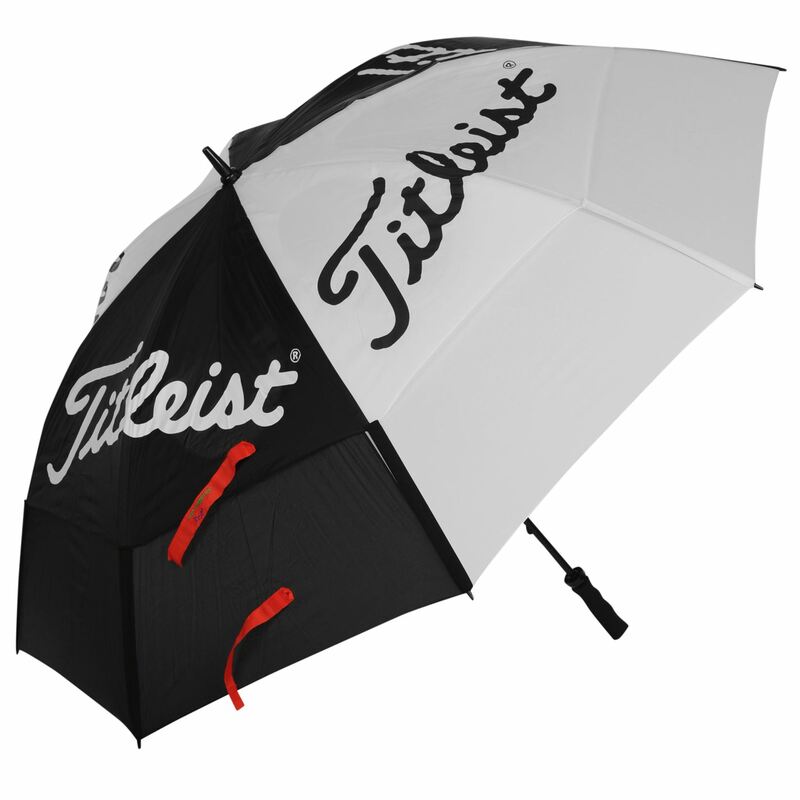 I won one of these last year at a scramble, and has turned out to be a good little golf umbrella: sturdy, compact, effective. I’ve had them all, at one time or another, and still have pretty much everything but the jackets and pants. However, for whatever reason, I haven’t been inclined to use any of these golf gear essentials in their intended damp environments of late. Perhaps it is the intensity of the recent storms. Maybe my constitution is weakening. Or maybe I’ve realized that during marginal weather, I’d just rather hang out with the The Wife, The Dog, and the One Bearded Baby. So the July Poll Question is actually two questions, Dear Readers. How much golf rain gear do you have? And how much of it do you actually use? Dave, I’ve found that in the summer months, all I need is an umbrella, towel, and rain gloves. The gloves are the key because you don’t have to keep your equipment dry if your gloves get tacky with water. In fact, on my recent trip to Myrtle Beach, it was so hot and humid that I sweated through a couple leather gloves and took out my rain glove to combat the moisture. Worked great. Good poll, thanks!